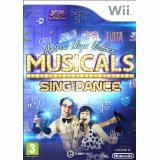 "Andrew Lloyd Webber Musicals: Sing & Dance" will be released exclusively for Wii on 9th November. It can be pre-ordered on Amazon for £19.99 with free super saver delivery. The description on the box says "Fans of hit musicals such as 'The Phantom of the Opera', ‘Sunset Boulevard’, 'Evita', 'Cats', 'Joseph and the Amazing Technicolor Dreamcoat' and 'Jesus Christ Superstar' will now be able to put themselves centre stage with this new game." It features 32 songs from 13 musicals including Evita's "Don't Cry for Me Argentina," Jesus Christ Superstar's "Superstar" and The Phantom of the Opera's "All I Ask Of You." It also features West End stars including Elaine Paige, Michael Crawford, Boyzone, Donny Osmond, David Essex and Sarah Brightman performing alongside the gamer. Players can choose between "Dance", "Sing" or "Career" modes and have the option of performing alongside up to three other gamers.